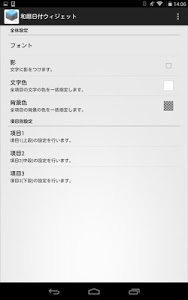 ・ In Android 8.0 or later, we have received reports of malfunctions that occur frequently. We apologize for any inconvenience this may cause. Some improvements have been made in version 1.4.1. ・ The release of version 1.3.8 has not been implemented. We apologize for the inconvenience. 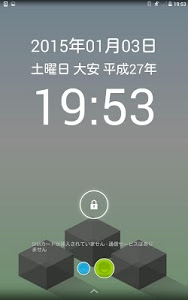 ・ We have received a bug report that the widget can not be displayed on Android 8.0 or later. We apologize for any inconvenience this may cause. 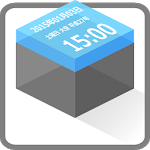 We have made a tentative response in version 1.3.8. We apologize for any inconvenience. We have made corrections in version 1.3.4. We apologize for any inconvenience. 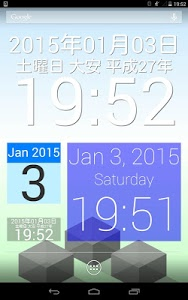 ※ The second unit seems to be about 5 seconds for the convenience of the system. -The initial state is a blank state of white character background clear. By applying an optional theme from Settings → Theme selection, you can quickly set the color for each day of the week. * 2 ... There is a partially unusable character string, such as a reserved character string for formatting. 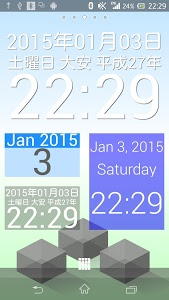 ・ When the terminal starts up, it takes some time to be displayed. -Update may be delayed immediately after returning from terminal sleep. ・ If the terminal date is changed to the past date, it will not be reflected. 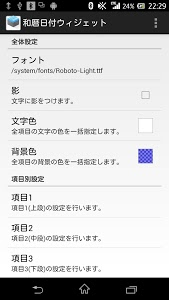 → It may be reflected by resizing or setting screen display. The time update timing tends to be unstable.